Pistorius trial day 20 - in 60 secs Jump to media player Oscar Pistorius faced another day of intense cross-examination at his trial on Friday - and said he "was in a panic" in the moments before he shot his girlfriend Reeva Steenkamp. Pistorius trial day 19 - in 60 secs Jump to media player Oscar Pistorius has faced a second day of intense cross-examination at his trial in which he was accused of being selfish, reckless and a liar. Pistorius 'lied and distorted' Jump to media player Oscar Pistorius has faced a second day of intense cross-examination at his trial in which he was accused of being selfish, reckless and a liar. Pistorius court shown gun video Jump to media player During cross-examination, South African athlete Oscar Pistorius has been shown a Sky News video of himself at a shooting range. South African athlete Oscar Pistorius broke down in tears as he was pressed by prosecutor Gerrie Nel about the moment he fatally shot his girlfriend, Reeva Steenkamp. Speaking on the fourth day of his cross-examination, the athlete, 27, said he had not intended to kill anyone but fired out of fear. 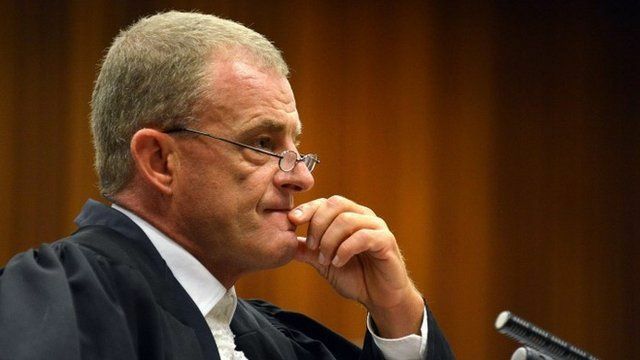 This prompted Mr Nel to say Mr Pistorius was changing his story from self-defence, to saying he shot by accident. The prosecutor said this was because the truth was: "You fired at Reeva." "It's not true," Mr Pistorius replied, breaking into tears and prompting the court to briefly adjourn.